The normal oral temperature is 35.8–37.3ºC (OER #1) or 96.4–99.1ºF. Oral temperature measurement is common and reliable because it is close to the sublingual artery. An oral thermometer is shown in Figure 2.2. 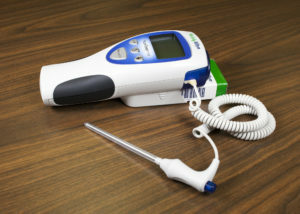 The device has blue colouring, indicating that it is an oral or axillary thermometer as opposed to a rectal thermometer, which has red colouring. Remove the probe from the device and place a probe cover (from the box) on the oral thermometer without touching the probe cover with your hands. Place the thermometer in the client’s mouth under the tongue and instruct client to keep mouth closed and not to bite on the thermometer (OER #1). Ensure the thermometer probe is in the posterior sublingual pocket under the tongue, slightly off-centre. Leave the thermometer in place for as long as is indicated by the device manufacturer (OER #1). The thermometer will beep within a few seconds when the temperature has been taken: most oral thermometers are electronic and provide a digital display of the reading. Discard the probe cover in the garbage (without touching the cover) and place the probe back into the device. See Figure 2.3 of an oral temperature being taken. Putting the probe cover on takes practice. You need to ensure that it snaps onto the probe. Sometimes the device will turn off after you take the probe out of the device if you take too long to put the probe cover on or insert it in the client’s mouth. If so, discard the probe cover and re-insert the probe into the device to reset it. Then try again. Healthcare providers often measure the oral temperature, particularly when the client is conscious and can follow directions. However, certain factors can lead to an inaccurate oral temperature, including recent consumption of hot or cold food or a beverage, chewing gum, and smoking prior to measurement. Healthcare providers should wait up to 15 minutes to take the oral temperature if the client is eating hot or cold food or drinking a hot or cold beverage and about 5 minutes if the client is chewing gum or has just smoked. Alternatively, a different method is used to measure temperature. 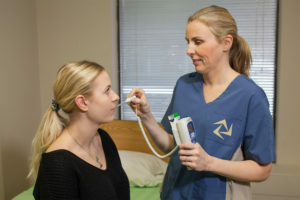 Measurement of the oral temperature is not recommended for individuals who are unconscious, unresponsive, confused, have an endotracheal tube secured in the mouth, and cannot follow instructions. Previous: What are Normal Temperature Ranges? Oral Temperature by Ryerson University is licensed under a Creative Commons Attribution 4.0 International License, except where otherwise noted.